Knew that this painting had been finished for quite a while, just waiting for me to understand that. It's a painting that came before the fact. It's been sitting there so patiently for a couple of months, waiting for the lovely lovely Katie to drape those blue Christmas lights around her staircase. waiting for me to walk outside with my camera and take pictures of that blue light against the leaves, waiting for me to walk back inside and suddenly see it for the first time. A true aha moment. A little unnerving, truth be told. 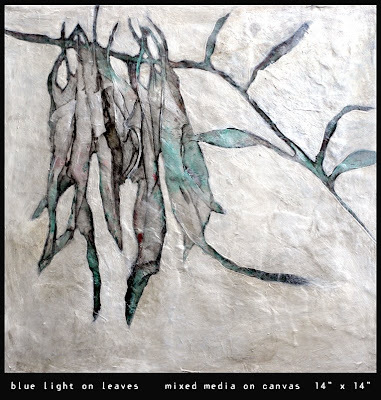 I'd thought it was done, I loved the blue on the dried leaves, but still didn't get it. What a patient little piece of art, no doubt smiling as I'd go by & glance at it, feeling it needed nothing else, but not sure. It just sat there, biding its time, knowing it was a Christmas present, knowing I'd unwrap its mystery in due course. As I said, a little unnerving, a little spooky. the moonlight through the clouds & fog. And, with the "AHA" goes the "Ooooooohhh"...."Aaaaaaaahhhh"! This reminds me of something old, like a portion of a beautiful fairy tale painting by Edmund Dulac. It has such a fanciful and otherworldly feeling, simply beautiful. A lovely, wistful piece, Debi. Such a rich gift from one part of you to another. "Blue light on leaves" happens. Michelle - Thank you also! I hope you're staying warm!!! Tango - Oh, I love Dulac. And Rackham & even Beatrix Potter. It used to be my dream to be such an illustrator. All their stuff seemed absolutely infused with magic. Thank you for the kind words. San - Yes, blue light on leaves does happen. If you build it . . .
Hele - Thank you. And a beautiful soul it is too. So beautiful. I loved Tangobaby's description so much that I can think of nothing to add. Your creation is beautiful, dear artist. Relyn - You are so kind & it is appreciated more than you know. If I ever win the lottery, I will take us all somewhere fabulous! I love so much the shimmer of this painting. It shimmers. The silvers and the whites and the blues...beautiful shimmer.